AKiPS Network Monitor is a scalable network utility that can be used to monitor your IT equipments across wireless and wired network devices. The program has been designed to run within a virtual machine environment. The networking tool boasts a simple and intuitive interface that can be easily navigated by rookies as well as professional users. Like other similar programs, the application performs all standard tasks such as data collection, analysis, alerting and reporting. The software empowers IT network engineers with the network visibility, allowing them to be better equipped to troubleshoot, investigate and fix performance issues. The network scanner for PC can monitor any type of equipment that implements network communication protocols, including Ping, Syslog and Netflow. 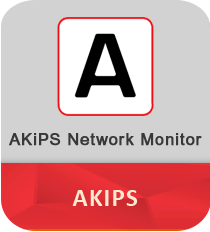 Download AKiPS Network Monitor to keep a track of your network activities. One of the best features of this network monitoring service is that it can discover a single device as well as an entire network connected to your network. It shows several details about the detected devices such as device name, current interface state, interface name, last time interface changed state, etc. The utility even displays three years of graphical statistical history of your network. The free version of network monitor software can also monitor CPU load, CPU temperature, power supply status, total memory utilization, etc. > Includes performance metrics for switches, APs, load balancers, controllers, routers, firewalls, etc. > Auto grouping of detected devices on the basis of interface types/speeds, vendors, etc.